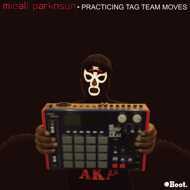 The legend that is Micall Parknsun is back on wax with The "Practicing Tag Team Moves EP". "Practice" has been smashing Parkys live shows all summer and is finally available on limited vinyl and digital.With production from the man himself and smokin cuts by Jazz T, this is not to be missed! Keep an eye out for the ill video by D Facer of UKHH.com. "Tag Team" has Jehst and Parky together again spitting back to back fire over a banging Zygote and Jazz T beat. "Moves" sees Parky and Durrty Goodz tearing it down on a killa riddim by Jazz T.
This dope release also comes with instrumental versions!